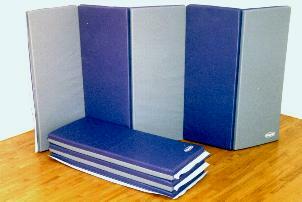 The UMT series of gym exercise mats is the standard for beginning exercise classes and elementary classes. The mats are two-inch thick urethane foam, and their soft open cell foam is very forgiving on the body. Program directors will appreciate the durability of high density urethane foam and reinforced vinyl covers. 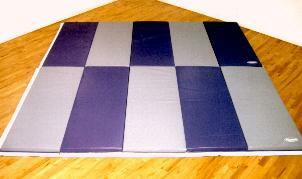 For tumbling activities, these mats are recommended for students up to 10 years old and 100 lbs. (Ordering Note: When specifying colors for mats with odd numbers of panels, specify first the color most often used. For example, in the right-hand photo above, the top mat is purple/grey, and the lower mat is grey/purple). We carry many other varieties of indoor mats. Call us with questions, toll-free.